Cary Grant as Dr. Praetorius, a medical professor at a small midwestern college, in Joseph L. Mankiewicz’s People Will Talk (1951). This entry was posted in academe, style and tagged academics who dress well. Bookmark the permalink. 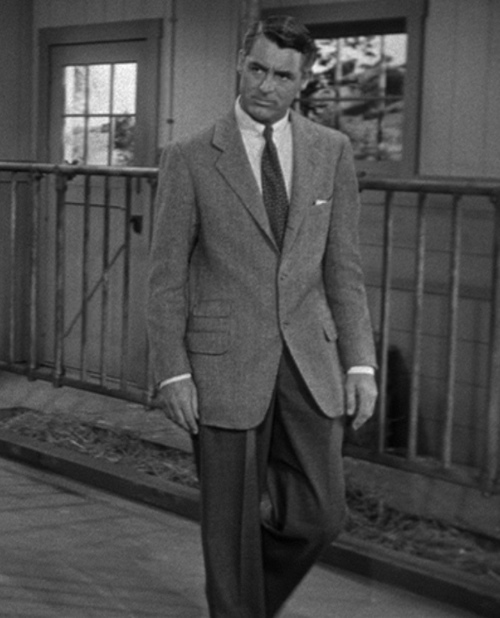 If I am not mistaken, Grant is wearing a three-button jacket in this film still. Is he not violating the cardinal sometimes-always-never buttoning rule, that is, the reasoning that the last button should never be buttoned in order to maintain the jacket’s overall shape? Buttoning the last button can sometimes have a pulling effect on the waist, which would disrupt the jacket’s position on the wearer. Thoughts? Probably a faux pas, but if anyone can pull it off, Cary Grant can.